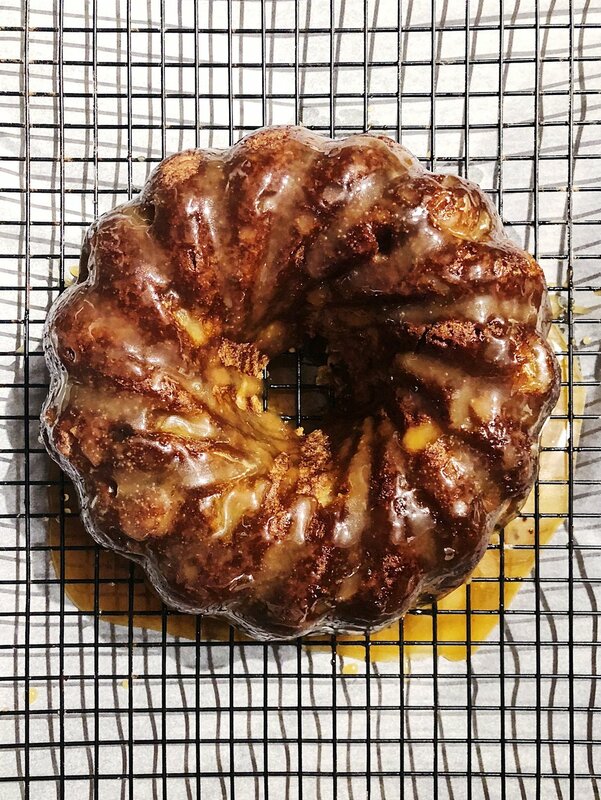 Honey Caramel Apple Cake Recipe — Triangle Pastry Co. I grew up going to the best Jewish delis and bakeries. I know this because my dad is an artist who routinely travels to New York and abroad and my mom is Jewish. It just goes with the territory. Rugelach, hamantashen, babka, challah, pumpernickel, matzo ball soup, potato latkes, pineapple noodle kugel, the most delicious bagels… man, I could go on and on. I’m vegetarian so I never got into the lox, gefilte fish, or chopped liver, but I know a good celebratory apple cake when I see one. And this, my friends, is quite a tasty apple cake. Not coincidentally, last week was Rosh Hashanah and I made apple cake. This Honey Caramel Apple Cake gets made in a bundt pan to celebrate the cyclic nature of the year. So, Happy New Year, yes. I wanted to acknowledge the roots, inspiration, and say Shanah Tovah. But can I also say, I want to make this cake all the time. It’s my snappy comeback response to the Salted Caramel Apple Pie that you see on every table and bakery counter from now til December. I don’t know about you, but I’m so done with the heat and humidity by this time of year. Even if it is not technically fall yet, I’m more than willing to bring out the boots, scarves, and jackets... Okay, so maybe it’s still too soon for all of those things in the southeast, but apple season is definitely here to kick off all the hygge feels, and I am ready for it! This cake is a perfect staple for your fall dessert repertoire because it is so adaptable. It takes flavor substitutions well. Switch cloves for cardamom? Sure, why not? Add some pepper for an unexpected twist? Go for it. You can mix and match fruit like pears and quince. Add a cup or so of toasted nuts or a handful of chopped dried fruits like cherries for a gentle personalized flavor boost. Make this cake your own. Melt the butter in the pot and set aside to cool slightly. Use a small amount of the butter to grease your pan. Coat the pan with sugar. Sugaring cake pans is an alternative to flouring them and your cakes will sing with joy. I learned this trick -- ironically NOT when I worked in a cake shop -- from Emma Laperruque when we worked together at Scratch. To take it even further, you can use flavored sugar (lemon, vanilla, almond, chili, thyme -- run wild with flavoring your sugar!) to add extra dimension to the character of your cake. Peel and chop the apples. Place them in a small mixing bowl and toss with the ¼ cup of sugar. Set aside to let off the juices. If you’re adding dried fruit, add it to the apples. In a large mixing bowl, whisk together the cooled melted butter, eggs, honey, molasses, vanilla, and sugar until homogeneous. Set the mesh sieve over the mixing bowl and sift the dry ingredients through it. Use a rubber spatula to stir until combined. Use your hands or a slotted spoon to lift the apples from their juices and then fold them into the batter with the spatula. Pour the cake batter evenly into the pan and bake for 50-60 minutes, until a toothpick comes out clean. Cool in the pan for 20-30 minutes, then turn the cake out onto a wire rack. Bring all ingredients to a simmer in the medium sauce pot. Stir the bubbling mixture continuously with a rubber spatula for 2 minutes. When just warm, drizzle the glaze over the cake. Share this tasty fall flavored treat with friends and family as the leaves turn and hayrides commence. You can store your Honey Caramel Apple Cake covered at room temperature for up to two days. Refrigerate if you manage to keep it around longer than that.